To suspend someone’s disbelief is to entertain them. We want to believe that the boxers in the ring are actually punching each other, that the injured vigilante running from the cops is actually bleeding, that the rowdy cowboys in the saloon breaking bottles against each other’s heads are actually throwing glass. We want to believe these scenarios, because that is what is being shown, that’s where the story’s at. We hear the glass cracking, we see the shards flying, but what is it that we are actually seeing? It can’t actually be shards of glass; think of all the potential injuries. The lawsuits! The Producer pulling his or her hair out in the corner. That’s where filmmakers have to get creative. Breakaway glass is often used as a substitute in stunts like breaking windows and bottles when an actor’s well-being is at risk. When combined with sound effects, reactions, believable labels, prop blood if necessary, the audience is less likely to question it – if it looks like a duck and quacks like a duck . . . Prop glass is often made from what is called sugar glass or candy glass because it’s less dangerous, can be molded into any shape and color, and shatters in a realistic way. Sugar glass, while transparent and sturdy, uses a candying technique and is really just a mixture of the easily accessible and edible household items: sugar, corn syrup, water, cream of tartar, and dye if desired. 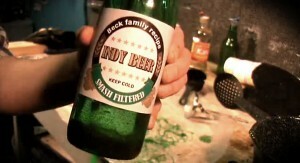 Using Indy Mogul’s step-by-step video tutorial, you can build your own breakaway bottle at home! Just follow the instructions for a simple DIY mold, pour the liquid sugar glass into it, let it cool, add the finishing touches, and your bottle is complete. If you don’t think you’re ready to take the challenge, you can also buy pre-made breakaway glass bottles online. Let the suspending of disbelief begin.